At the grocery store chain Wegmans, for instance, which recently began offering Aira services at all its stores, blind and low-vision shoppers can activate the Aira app to connect them with professionals who help them move around the store, find what they want, and direct them to the shortest checkout lines. By speaking with these customers on the phone, the agents essentially act as a second pair of eyes for them. Aira is available in some restaurants, college campuses, and airports, and is branching out to other places like AT&T stores. During a time when discussions about inclusion in retail have often focused on size, gender, or race, the emergence of technology like Aira underscores the importance of challenging ableism by making shopping more accessible for people with physical impairments. People with blindness and low vision can use Aira for any number of things — from sorting mail or walking through an airport to getting around a college campus — and the possibilities for retail are growing. Last week, AT&T began offering the Aira service at its more than 5,000 stores across the US. When customers with blindness or low vision walk into any AT&T store, they can use the Aira service without charge, even if they’re not an existing Aira subscriber. Aira’s monthly plans range from $89 to $329, which means low-income people may not be able to afford the service, though they may be able to include it as a tax deduction. Because people with disabilities are more likely to have financial struggles than the general population due to employment discrimination, the cost of Aira and other forms of technology is likely to hit them doubly hard. For those who can access the service, though, they’ll find it useful in places like the New York-based grocery store chain Wegmans, which announced in August that it would offer Aira in all of its locations. Wegmans operates 97 stores in six states, and it is currently the only supermarket chain to offer the service. In December, Aira also announced a partnership with the ride-hailing service Lyft. Aira agents will help users request rides, direct them to pick-up spots, and let them know when drivers have arrived. This is a marked contrast from Lyft’s competitor Uber, which has faced claims that it discriminates against people with blindness. A Boston woman recently filed a complaint saying that Uber drivers have routinely rejected her as a passenger when they spot her seeing-eye dog. Transportation is hardly the only area where people with blindness and low vision struggle for access. Shopping for clothes, online and off, remains particularly challenging for consumers with visual impairments. In June, Guardian columnist Frances Ryan used Twitter to ask people with disabilities how clothes shopping could be made more accessible. A woman with blindness answered that she has trouble buying clothes online because many retailers fail to provide digital descriptions of their apparel beyond the color, and some don’t even do that. Others complained of cluttered aisles and store policies that prevent their partners or companions from entering dressing rooms with them to help them try on clothes. Retailers sensitive to these issues and apps that would allow customers to sidestep them could help. Aira told NPR that a major retailer will announce a partnership in October, but it did not specify what kind of retailer. 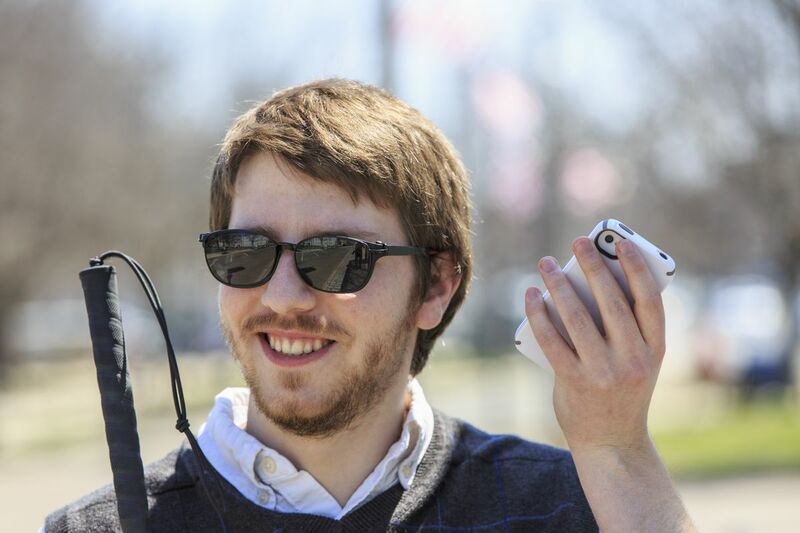 A man with blindness uses a smartphone during his walk. Aira may be an emerging leader in its field, but it’s far from the only app available to people with blindness or low vision. The Denmark startup Be My Eyes offers a free app that allows video calls with sighted volunteers to help visually impaired people complete everyday tasks and maneuver their surroundings. Microsoft’s free app Seeing AI deciphers and reads text the smartphone camera spots. This app is beneficial to shoppers with vision impairments because it can actually tell users the color of clothes or other goods. Additionally, it can read barcodes on products; recite product names, descriptions, and instructions; and read US and Canadian currency. And for years, the KNFB Reader, available for about $100, has earned a following among people with blindness and low vision because it can read menus, documents, fliers, and other print. While these apps certainly help, they also highlight the pervasiveness of ableism in society and the measures people with vision impairment have to take to better survive a seeing world. Technology is a tool that allows them to be more mobile and independent, but more work needs to be done until full inclusion is realized.